Cystic fibrosis is a disease that affects way to many people, and one MMA fighter is helping in the fight to find a cure. Craig Machado, a 27-year-old MMA fighter for Baltimore BJJ, has been planning his next fight around raising money from sponsors to go to the Cystic Fibrosis Fund of Maryland. If you are interested in donating, check out the webpage on the CFF website to make your donations. Remember any amount helps. “The deal: you sponsor me in my next fight. If I win, you double the money. It is that simple,” Machada said. Craig Machado is training for his upcoming title fight June 19 where he is raising money for cystic fibrosis in honor of a friend who passed four years ago. My idea: I am a MMA fighter and have an upcoming title fight June 19. I want to get sponsors for this fight. The deal: if I win, double what you pledged. Any amount is appreciated. I want to thank my coach from Baltimore BJJ, Lee Synkowski and striking coach Rahsaan Kimbrow from www.bmorefit2fight.com for working with me and getting me this far. All my sponsors who have been there for all my previous fights– Stotler Chiropractic and VU skateshop—and all my new sponsors–Coach Falcon’s Fit Bodies, Terrapin K-9 Academy and Recher Theater in Towson– I greatly appreciate you putting up with and sticking with me. After two rounds in the ring, the decision was made and the winner of the fight announced. 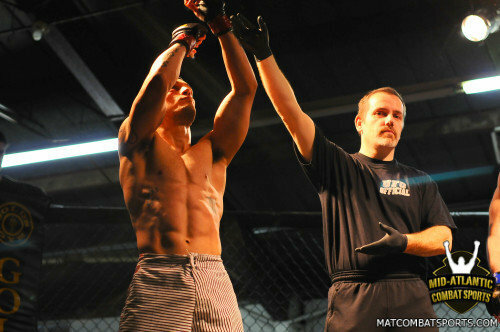 Craig Machado raised his hands in victory after winning a second round submission victory Saturday March 13 against his opponent, Nick “Hercules” Hanzivasilis. The first round was tough, but going back in the cage, Machado knew he had an advantage. In the first round, Machado was taken down, but swept Hanzivasilis and mounted him. After Hanzivasilis escaped, Machado dropped him but was then caught in an armbar and swept as the first round ended. The fight took place in Fredericksburg, Va. on March 13 at the Fredericksburg Fairgrounds. Barbarian Fight Club sponsored the event. 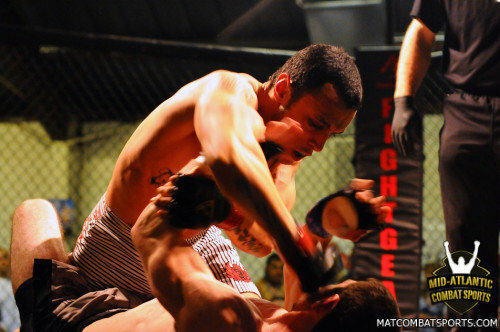 Machado had his last fight at BFC against James Foy, where he lost in a split decision. Machado said that losing the fight to Foy made him train harder to prepare against Hanzivasilis; this time he wasn’t ready to lose, especially motivated by his coach Lee Synkowski and striking coach Rahsaan Kimbrow. “Fighting for him isn’t like fighting for a coach; it’s like fighting for family, and I’ll be damned if I’m going to let my family down,” said Machado on Synkowski. His striking coach, Kimbrow, not only got him physically in shape but helped Machado get the confidence to end the fight in his favor. **Interested in getting trained by Craig Machado? Send me a message or email and I will get you in contact with him. He trains at Back to the Basics in Towson, Md. if you are looking for a new gym as well. The sweat flew in the air almost as fast as the blows to his teammates gloves. Craig Machado, covered from head to foot in a black sauna suit that looked like a trash bag, never stopped moving around the gym as he jumped, jogged or punched in tune to the rock music playing in the backround. 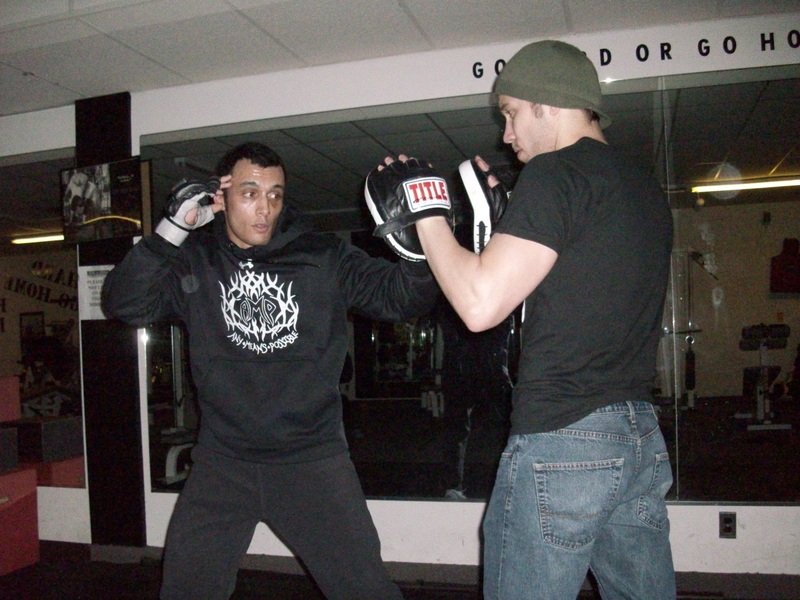 Thursday was his last night of training hard before his mixed martial arts fight in Fredericksburg, Va. on Saturday. The sauna suit was to help him sweat out the 13 pounds he needs to lose so that on Friday, when Machado has to weigh in to make weight to fight, he is down to the 145 pounds where he needs to be. “I started dieting last Thursday and I started at 165 pounds; tonight I weighed myself at 7 p.m. and was at 157.8 pounds. I need to get to at least 146–they give a one pound allowance–so that I’m not close to not fighting like I almost was in two other fights,” the 27-year-old fighter said. Machado has fought six times with a record of 3 and 3. He said his last fight, though lost in a split decision, was his best fight.